If you’re experiencing issues with your refrigerator or ice maker, a good place to start is by checking up on your solenoid water valve. But what the heck is a solenoid water valve? A solenoid water valve is an electromechanically operated valve which is controlled through an electric current within a solenoid. Solenoids, which are coils wound tightly into a packed helix, create quick and safe switching, long life in service, high reliability and low control power. These special valves are used quite frequently in fluidics. The job of a solenoid valve is to turn off, dose, release, distribute or combine various types of fluids. A popular solenoid water valve is the ASCO solenoid. This blog will outline exactly how solenoid valves work, as well as what the common types of solenoid valves are in order to help you reach a better understanding of your refrigeration system and its many components as well as possible issues. There are a lot of different valve designs. Regular valves can contain many different ports and paths for fluids. For instance, a two-way valve has, clearly, two ports. When the valve is open, the two ports are connected, allowing fluid to flow in-between the two ports. If the valve is in the closed position, the ports are closed off from each other. When the valve is open when the solenoid isn’t energized, the solenoid valve is considered N.O or normally open. Likewise, when the valve is closed at a time when the solenoid isn’t energized, the valve is considered N.C or normally closed. A small solenoid can create a limited amount of force or power. If said force is strong enough to activate the valve open and closed operations, a direct acting solenoid valve occurs. Some solenoid valves are designed so that the solenoid directly acts upon the main valve. Other solenoid valves use a smaller solenoid valve. This is also known as a pilot. This pilot activates a larger valve. Piloted valves need a lot less power in order to control, however are quite a bit slower. They also tend to require full power constantly in order to open and remain open. A direct acting solenoid could potentially only need full power for a short amount of time in order to open the valve – and a lower power to hold it open. In terms of a direct acting solenoid valve, they tend to operate in 5-10 milliseconds. A piloted valve, depending on size, operates between 15-150 milliseconds. One important point to note is the body of the valve should be compatible with the specific fluid being used. The seals also must be proven as compatible with the specific fluid in order to work properly. All other materials used should also be compatible with the fluid being used. Any other component that you see may be exposed to fluid should also be compatible with the fluid you’re using. This will greatly reduce chances of running into any issues. However, it’s a bit easier said than done. It should be noted that the core tube needs to be non-magnetic in order to pass through to the main plugnut as well as the core. The plugnut as well as the core need to be made with materials that have decent magnetic properties. These materials could be iron; however, iron is corrosion-prone. A great substitute is therefore stainless steel as they are made in both magnetic and non-magnetic types. 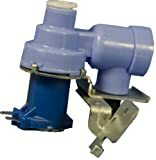 When Would I need to Use a Solenoid Valve? Image via Plast-O-Matic Valves, INC. While solenoid valves can be used in a wide-range of industrial applications, that involve liquid control. The main concern people have when coming to this site, is solenoid valves within their refrigeration and ice making systems. Solenoid valves are meant to control water entry to and from the industrial application – which is a very important aspect of a refrigeration appliance. By learning more about solenoid valves, how they work and used, what their purposes are and common issues, you’ll be able to fix your refrigeration or ice making issues independently and without as much hassle. Solenoid valves involve many different parts and considerations. Although it’s only one part to your appliance, they’re extremely important and can make or break the overall effectiveness of your appliance that you depend on for everyday life. By choosing a solenoid valve brand that is trusted and well-known within the appliance market, then pairing your quality material with in-depth knowledge and understanding of how it works, you’ll be able to avoid headache and misfortune down the road when your appliances go South!